This is a six night, six day holiday designed for riders with a good level of ability. It's for those who have a great passion for Dressage and are ready to work hard for a week to really get a "push on" with their riding. As well as this, it is aimed for people who are not only interested in the Classical Dressage ways of riding, but also in the procedures used for training these magnificent horses. This is a unique opportunity, not easily found at other establishments. Guests will be immersed in the day to day riding and training that goes on at Epona. It's a great chance to get a real good feeling of the sensitive Andalusians and Iberian horses, trained to High School level, and to enjoy some of the advanced movements, such as Passage, Piaffe and Spanish Walk, which even very good riders don't often get a chance to experience. This program includes many private lessons, one of which will be with Olympic medalist Rafael Soto, semi private lessons, ground work sessions (working on training piaffe, passage and Spanish walk) and lunge sessions, working on improving the classical seat. Most of the lessons will take place in the morning leaving most afternoons free for guests to enjoy some shopping or sight seeing in the nearby towns, if they wish, or, altematively, to stay at our facilities just relaxing or watching the afternoon lessons and other riding that might be taking place. 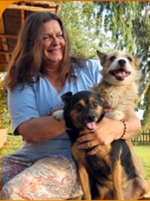 (In fact, some guest often opt to join these lessons as an extra if places are available). The Epona programs are set in an impressive 16th Century Hacienda where the García family will make you feel totally at home. The programme includes visits Jerez de la Frontera (to see the Show "Those Amazing Dancing Andalusian Stallions"), and a visit to Seville on the last evening for a typical Flamenco Dancing Show. Rates include*: Six nights accommodations, breakfast and lunch, riding program. Rates do not include: Dinner (€10 +), Dinner and ticket for the Flamenco Show in Seville. ticket to the Jerez riding school Riding Helmet Required!! Guests arrive in the aftenoon either by pick-up at the train station in Seville (10 - 20 minute drive) or by means of their own transport. A free transfer service is offered at 4:30 pm from the Santa Justa Train Station). You will then be escorted to your hotel in the nearby town of Carmona, one of the famous white villages of Andalucia. Carmona is the oldest continually inhabited village in Europe and as you stroll through the narrow streets of the old town, you will feel and breathe the spirits of ancient cultures (Iberians, Visigoths, Phoenicians, Romans, Moors), in the innumerable examples of their architectural influence in the churches, towers, palaces and mansions as well as in the inherited customs. Once the lessons are over, relax with a book in the garden or by the pool. You are also more than welcome to stay and sit by the arenas and watch the daily training of our horses. 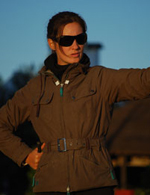 Vivi, our main horse trainer will be more than happy to answer any questions about our training methods and our horses. Meet the rest of the group for lunch in beautiful dining room, where you will have your experience of typical Andalusian home cooking, courtesy of our resident cook and sample our excellent local house wine. Early breakfast and pick up at the hotel at 9.00 a.m. before leaving for Jerez de la Frontera, in the province of Cádiz, one hour and a half away by car. Jerez is internationally renowned for its production of sherry and brandy. However, the main attraction of the day will be the visit to the Real Escuela Andaluza del Arte Ecuestre, an equestrian performance titled, "Those Amazing Dancing Andalusian Stallions" (Ticket Price: 27 €). Here you will have the privilege of seeing the magnificent Andalusian stallions at their best, at home in the breathtaking setting of their 18th Century palace and the riding hall. They will be performing piaffe, passage and the airs above the ground (courbette, capriole, etc) in a spectacle of light, music and colour, comparable only with the famous Spanish Riding School of Vienna. Fernando is well known at the school and is good friend with many of the world famous riders. Vivi trained at this school for four years and frequently performed in the show. The same as Monday, including your second lunge session. From it's origin in Ancient Greece with Xenophon, until the present times embodied in the four European Schools of Equestrian Art, Classical Dressage has evolved into different styles, but always maintaining the same goals: To achieve beauty and perfection in the performance of dressage and High School movements only possible through harmony, balance and complete communication with the horse. Classical Dressage went beyond admiration for the rider for his courage and skill as a soldier, but gradually started to appreciate other talents such as feeling and sensitivity elevating horsemanship to a new level: horses began to "dance" and Dressage gained the status of a new form of Art. Comparable to Ballet, it requires the technique and strength of the athlete , but also the sense of feeling and aesthetics which, when performed correctly will succeed in moving the spectator. At Epona we have horses and Instructors prepared to cater for guests of all levels, from complete beginners to advanced riders. Groups are divided according to riding level and usually comprise of 2 to 4 riders. The excellent facilities including a large covered school will make your lessons more enjoyable.The Epona instructors are qualified by the British Horse Society and the Spanish Equestrian Federation which means that they are trained to always have the horse and rider's safety at heart. Moreover, when it comes to Dressage the knowledge gathered having trained under many masters of various nationalities has allowed them to form their own training and teaching techniques, where the pupils learning and enjoyment is the main priority as well as safety and the horse's wellbeing, while always keeping in mind the principles and objectives of Classical Dressage. Beginners will hugely benefit from the lessons because although things are kept simple, you know that your basic skills will be correct and solid, enabling you to pursue whichever discipline you choose down the road. 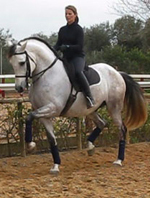 At a more Basic level, lessons will focus on the riders balance, seat, position and control, enabling riders to gain confidence in the three basic gaits; walk, trot and canter. When working with more experienced riders, instructors will provide guidance towards riding the horse in a correct outline/frame, straightness, balance, rhythm, etc. As the week progresses, lateral movements such as shoulder in, travers, renvers, half pass, and depending on the riders level and ability, flying changes, pirouettes, etc. High School work for advanced riders will be paid for separately as private lessons. (there are some jumping horses, but the center concentrates mainly on dressage). 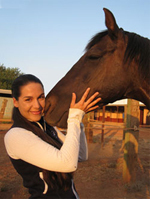 There are horses and instructors available for guests of all riding levels, from complete beginners to advanced riders. Groups are divided so as to keep the levels similar and these are comprised of 2 to 4 riders (on some occasions the groups could be of 5, in which case, the duration of the lesson would be extended). Although we are more dressage oriented, we have over 10 jumping horses from schoolmasters for beginners to National C competition level. He has ridden since he was a child and has competed in show jumping. 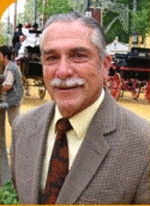 He has had a complete dedication to horses for over 30 years.